These are custom billet aluminum turntable feet. They fit all 1200 series. These are available in many different colors. If the color you want is not on here as an option, you can tell us what color you'd like. The default color is brushed aluminum as pictured (silver). As you all know by now, I’m a Technic 1200’s enthusiast. I have Dj’d on Technic 1200’s since 1990. I’ve also been repairing & customizing them since then. The 1200 series is great. Both for audiophiles & Dj’s alike. I’m more on the Dj side. I do play my records on my 12’s, but I mostly Dj on them. I’ve noticed some things that could be improved on these tables. Things that would be better for us Dj’s. For example I created my own STR8 Arm for these 1200’s. They track a lot better than the s arm. Which is better for scratching and Dj’ng overall. 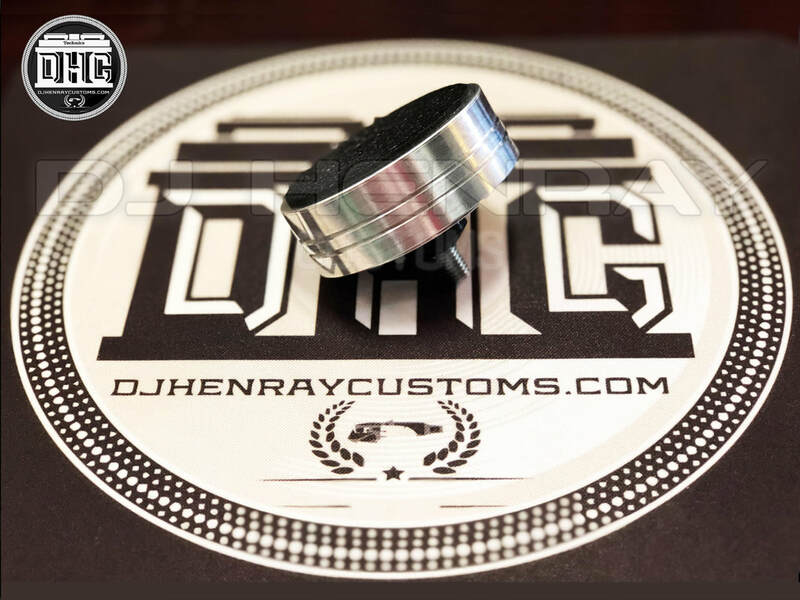 Now I’ve fabricated custom DHC turntable feet. These are cnc made and are billet aluminum. Solid and customizable to match your custom Technics. They are a great alternative to the original feet. Especially now that they are scarce. These are available in silver, chrome, & a variety of powder coat colors. These feet aren’t as wobbly as the original ones that come with the 1200’s. The original ones tend to break & are made out of plastic & rubber. The pieces are glued on and over time, the glue wears off and parts separate & get lost. My custom feet on the other hand are solid aluminum & fit nice and sturdy. Giving us Dj’s a lot more stability. This makes for less motion and less needle skipping. These feet are now available. You can order online or buy in store. Let’s keep on rocking these Technics 1200’s! Tell us what color you want.